Songkhla born artist Sagon Luerit moved to Chiang Mai to study at the Faculty of Fine Arts at Chiang Mai University and like many others, stayed to find the area offered great inspiration. 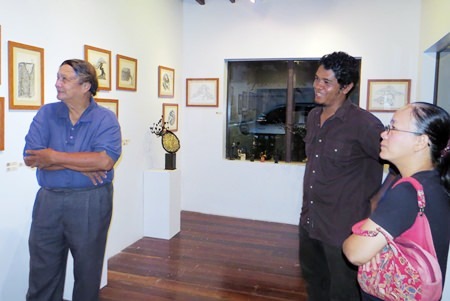 The artist held an exhibit of pencil drawings, paintings and beautiful steel sculptures at the Meeting Room Art Café on November 1, 2014. The artist studied sculpture at CMU and his sculptures evoke bonsai trees as a positive way in which humans have cultivated nature in a way related to meditation, heritage and the relationship between the seasons. The exhibit is on display until November 15, 2014.